My meditation starts at this Tuesday, Sep 29, 2015. 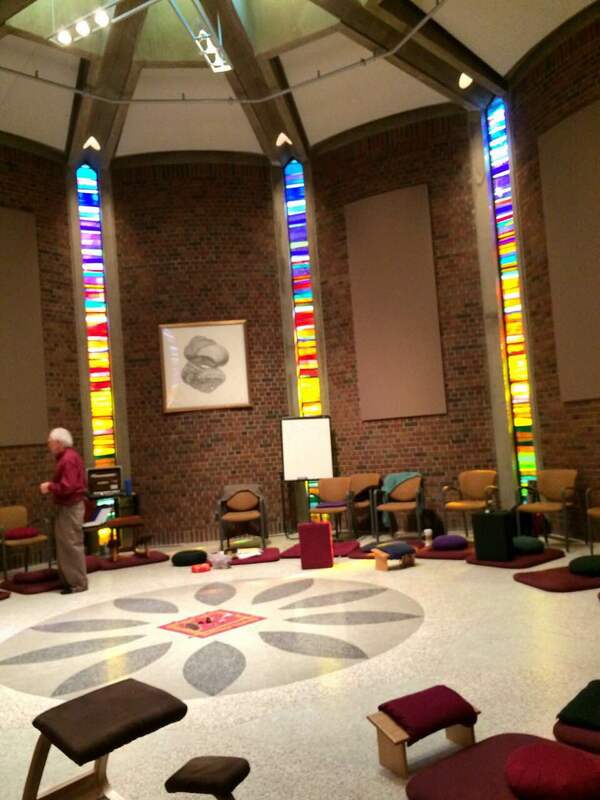 I take a class from center of spirituality and healing, with Dr. Erik Storlie in this semester. He has studied meditation with Zen Master Shunryu Suzuki Roshi and Dainin Katagiri Roshi. He suggests us, as meditation beginners, begin the meditation by visualizing a safe place in our mind’s eye and imagination. Dwell in that refuge for a time. In the formal sitting meditation practice, let the focus of the attention rest on the flow of the breath. Notice the rising and falling of the chest and belly, the feel of the air moving in the throat and the nostrils. Allow thoughts to rise and fall, neither encouraging nor discouraging them. When we find ourselves caught up in thoughts, just gently bring the mind back to awareness of the breath flowing. Sep, 29, 3:30 pm, I meditate in the meditation room for 15-20 minutes in the class with other classmates with the instructor’s lead. Oct 2, 6 pm, I stand in front of my apartment, looking at a big tree and trying to meditate. I don’t set timer so I don’t know how long it takes. I guess I only spend 3-4 minutes. I find it very easy to be distracted. I think a lot about when my friend will come to pick me up for dinner. Oct 4, 5 pm, I sit in the Como lake dock, facing the lake. I try to focus on my breath this time. I hear many different sounds, like kids and parents’ conversation, a band’s song playing, the sound of a dog’s leash, etc. Then I gently bring my focus back to my breath. I don’t set timer either at this time, but I remember the time when I start. And I meditate for 5 minute this time. The most difficult part is to be mentally prepared of meditation. I have a lot on my plate this semester; I am involved in two research projects, I take two academic courses, I teach one course, and I serve on several committees and associations. Sometimes, I feel I don’t have time to take all these stuffs off my plate; I don’t have time to do meditation other than these “important” things. I need to intentionally tell myself I have to take care of my physical body and my spiritual mind. Only when I take care of my whole self, then I can do my work, research, and study better. I also think that for beginners, we can start with easier and shorter meditations, like several deep breaths. Count one breath in, one breath out, and continue through 10 breaths, then return to one again. Oct 6, 2:30 pm, I meditate in the meditation room for 15-20 minutes in the class with other classmates with the instructor’s lead. Oct 7, 2:20 pm, I sit in the bench in front of the sociology building and meditate for 3 minutes before I go to SNA class. I am distracted by my thoughts on my current project for a couple of times, and then I gently take my attention back to my breath. Oct 8, 11:45 am, I sit at the bench in the grass ground before LES building and meditate for 9 mins before I go to work in my lab. It is a beautiful weather outside, and I enjoy the sunshine during my meditation. I count my deep breath and try to focus on my breaths. It works. I am still distracted by some thoughts, but I just gently bring my attention back to my count. Oct 11, 4:00 pm, meditated when I walked in the wood in mille lacs kathio state park with two of my friends. I enjoyed my walk and the beautiful weather. In this week, I started to try breath in and out exercise. Every time, when I meditated, I counted one breathe in, one breathe out, and continued it through 10 breathes, then I returned to one again. It takes 3-4 rounds in ten minutes. When I focus on counting, the time goes fast. This morning, when I did my dishes, I was thinking about my schedule, papers, meetings of today. I was a little stressful about all these things I have to finish today. Then I realized there is always something going on my brain, about the past or about the future. Generally, I focus a lot on the future, like things I have to do today or this week. I always have a to-do-list on my brain. After trying the breath-in-out exercise, I feel it’s helpful to just focus on my breath for a few minutes, or just a few seconds when I stress out or worry too much on the future. Even now, I am typing, I am thinking about the paper I have to write after this reflection. So, before I write this very sentence, I counted three deep breathe and then I finished this sentence after the deep breaths. In this way, I feel I can more focus on the present, I feel more engaged in this moment, and I feel less worried about the future.